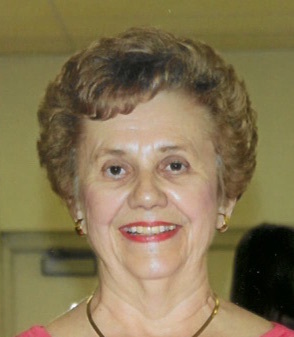 Marie Ellen Cluskey, 78, of Germantown Hills, IL passed away at 11:53 pm on Thursday, April 11, 2019 at the Richard L. Owens Hospice Home in Peoria. She was born on September 25, 1940 in Peoria, IL to Russell and Emma (Schwenger) Fehl. She married Charles A. Cluskey on April 30, 1960 in Peoria, IL. Surviving are her husband Charlie of Germantown Hills; sons Brian (Janna) Cluskey of Germantown Hills, Bruce (Mary) Cluskey of Lombard, IL, and David (Becky) Cluskey of Lewisville, NC; and eleven grandchildren. She was preceded in death by her parents. Marie was a secretary for C & S Builders for 28 years. She was a member of St. Mary of Lourdes Catholic Church in rural Metamora. Marie devoted her life to her family, married to Charlie for nearly 59 years (April 30). Together they raised three boys: Brian, Bruce, and David. Charlie and Marie never missed an event for their boys growing up. Somehow, Marie also had time to have fun with “the Girls” – playing bridge, golfing, and bowling. And there are not many “who done it” novels she has not read. Marie also loved attending events for her eleven grandchildren and participating in many family gatherings. Charlie and family would like to extend their deepest gratitude for all of the prayers and support through Marie’s 4+ year battle with cancer. They appreciate the devotion, expertise and care provided by her team of medical professionals, especially Dr. Le-Lindqwister at Illinois Cancer Care, Dr. Alain Vilatte, and the Richard L. Owens Hospice Home. A Funeral Mass will be held at 10:00 am on Tuesday, April 16, 2019 at St. Mary of Lourdes Catholic Church with Father Greg Jozefiak officiating. Recitation of the Rosary will be held at 3:30 pm on Monday, April 15, 2019 at Mason Funeral Home Germantown Hills Chapel with visitation to follow from 4:00 pm until 7:00 pm on Monday at the funeral home. Burial will be in St. Mary of Lourdes Cemetery in rural Metamora. In lieu of flowers memorials may be given to Illinois Cancer Care, 8940 North Wood Sage Road, Peoria, IL 61615, OSF Richard L. Owens Hospice Home, 8630 State Route 91, Peoria, IL 61615 or St. Mary of Lourdes Catholic Church, 424 Lourdes Church Road, Metamora, IL 61548. Online condolences at www.masonfuneralhomes.com.